The Sultan's Cuisine range of Middle Eastern sauces, made from traditional recipes and quality ingredients sourced from the Middle East. To create an eye-catching brand and new packaging to compete with the big brands in the major supermarkets. Fly teased the brand story and romance of Middle Eastern imagery into a powerful brand. Imbuing the packs with a magical star-scape and Arabian night sky which tantalises the viewer and promises a mystical journey of taste, with the excitement of something new, exactly what the majors supermarkets have been looking for in line with the growth of ethnic foods. On shelf the packs create a powerful wave of branded header with striking variant colours, a clear message to create that desire to buy. Using evocative graphics, gold and lush rich colours reminiscent of jewels, silk cloth and midnight skies matched with clever copy we have created a range of materials that reflect the brands true values. 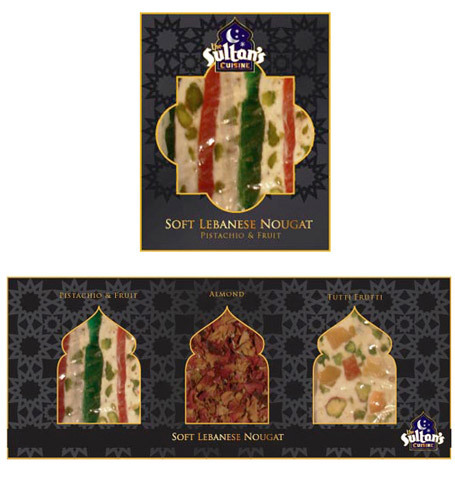 Increased sales and currently on sale in Tesco, Asda, Musgrave stores and in Holland, where The Sultan's Cuisine had previously struggled to attract supermarket interest due to its poor brand and packaging.